Good afternoon boys & girls and animals. Welcome to the almost world famous AoS Pet Thread. Kick off the shoes and converse with your fellow animal enthusiasts. Wow. A cat who has a human like face. Every man Everybody should have a dog. Good news. Missing pony is found. Found in a weird place. Cute pup and congrats!!! Good luck with training. And thanks for thinking of the Horde to share Motley's photo with us. Devoted Pet Thread fan Peter here. 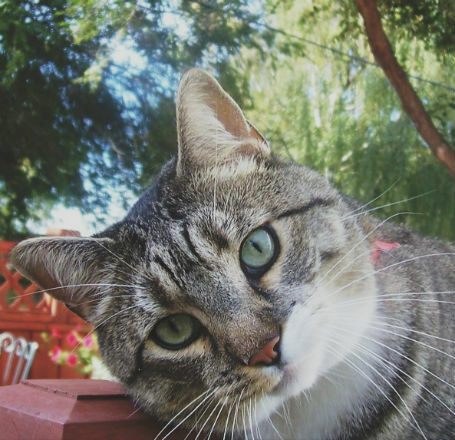 The in-your-face gray tabby is Doc, a streetwise stray given to us by a friend back in 2000. Photo taken in his prime, about a decade ago. Diagnosed with a jaw tumor in 2013, he was given a year at most but thankfully survived in good trim for over four, departing from us a year ago just after his 18th birthday. A show-off and a bit of a boor at times (he once rudely chased a Dalmatian out of our yard), he was nevertheless charmingly, brilliantly, 100 percent cat. 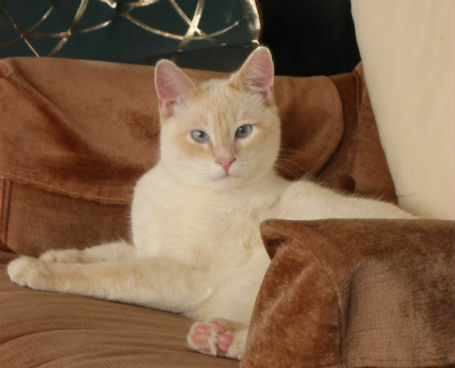 Not so our slightly cross-eyed flame-point, PG, who is 50 percent human. Photo a decade ago but still hale and hearty now at 16. We adopted him as a companion kitten for Doc. PG was for P.G. Wodehouse and “Perfect Gentleman” (compared to Doc). Being part Siamese, he will reply to any question you ask him, in one of 5 different languages, none of them English. 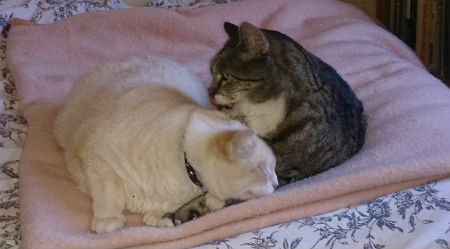 He and Doc had many epic, fur-flying wrestling matches but also many snuggly naps, often including Doc’s daily head-wash of PG pictured here. Both guys utterly unique and irreplaceable. What beautiful cats!! And they appeared to have been best buddies on top of it. You can never replace a pet. You can get a substitute but never a replacement. Thanks for the submission!! 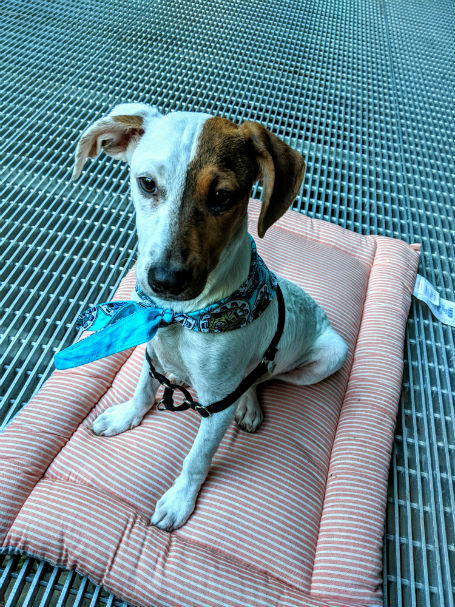 My wife and I recently adopted a puppy from a local rescue organization. Her name is Poppy and she came from the Turtle Mountain Indian Reservation in North Dakota with a brother and a sister. The mother died of unknown causes when they were around 5 weeks old, and the puppies were surrendered to Turtle Mountain Animal Rescue, and then transported to Coco's Heart Dog Rescue near the Twin Cities. 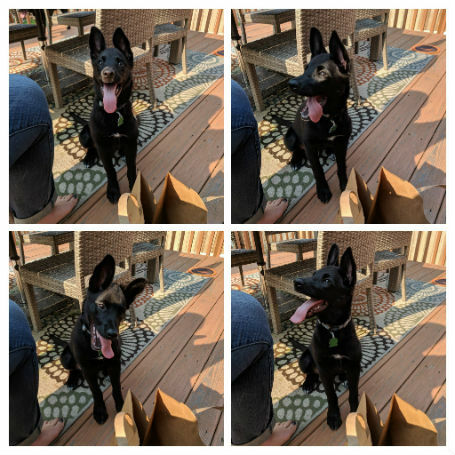 They believe that she is a Lab/German Shepherd mix (and I believe it too based on her ears), eventually we will be doing some DNA testing to find out for sure. The rescue organization and her foster mom noticed an occasional limp from her front left leg. They took x-rays of the leg which were inconclusive, and they suspected a growth plate injury that would likely get better with time, but that it needed to be monitored. We ended up adopting her at approximately 12 weeks of age, and she is now almost 18 weeks. She has been an absolute joy to have around, and has integrated well with our two older dogs, but most of all with her sister Stella (black lab/border collie). They love to wrestle, chase and play tug. Most of the time, most people probably wouldn't even notice her limp. Though you could definitely tell that something was wrong when she was tired, or after a particularly active day. Upon further examination by our veterinarian, they noted that the pain was up closer to her shoulder area. X-rays revealed a serious injury to the shoulder joint that even my untrained eyes could clearly see before they even pointed it out. We were presented with 2 surgical options for treatment. Amputation or Arthrodesis (pins, plates and fusion of the joint to stabilize it). Arthrodesis would have required 6-8 weeks of recovery time with severely limited activity and a lot of pain...with no guarantee of success and the possibility of further surgeries and/or possible amputation. Even if everything had gone right, she would have very limited range of motion. Amputation on the other hand has a much faster recovery time, and most dogs thrive on 3 legs, especially when done at a young age. To us, the choice was pretty clear that amputation would be the best thing for her. She had surgery on July 5th. During the surgery, the vet discovered canine bite marks near the shoulder, so they suspect that the mother or another dog must have severely bitten her at a very young age. If it had gone untreated, it would have continued to cause her significant pain that would have only worsened with time. 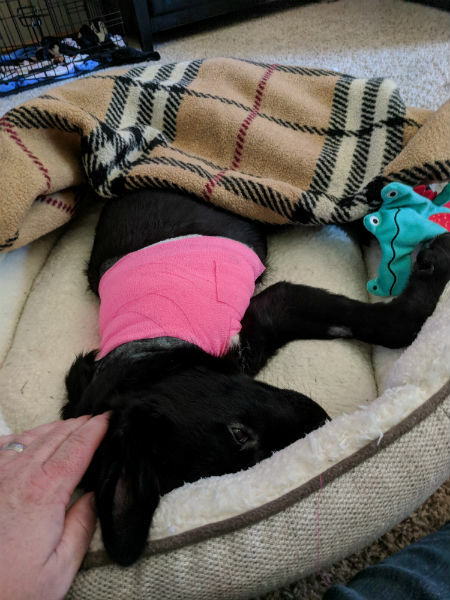 The first night after surgery was a nightmare with a screaming/crying/biting/thrashing dog suffering from dysphoria (due to narcotic pain meds and anesthesia drugs). Neither my wife or I could get any sleep, she needed constant attention to calm her down and to keep her from hurting herself. The only positive thing in this time was that her appetite (normally very healthy) was completely unaffected, and she was a completely different dog when she could eat. About 24 hours after surgery, a switch flipped and she was feeling much better and getting around very well. 48 hours out and she is still doing great and has her tripod stance down perfectly. She is still sleeping a lot, which is a good thing...though she sometimes has trouble finding a comfortable spot to lay down because she doesn't want to lay on one side all the time. If anyone out there ever has to face a decision about amputation for their pet, please know that there are plenty of 3 legged dogs out there that thrive. It can be a hard decision and process, but I can confidently say that she is going to do great. First of all, I'm not much of an editor. I appreciate you taking the time and sharing Poppy's photos and story. Cute pup. Good luck with her recovery and all of the training that comes along with a puppy. Thank you to those who submitted stories and photos this week. Greatly appreciated in the middle of summer. Do you have a photo of a pet you would like to share? 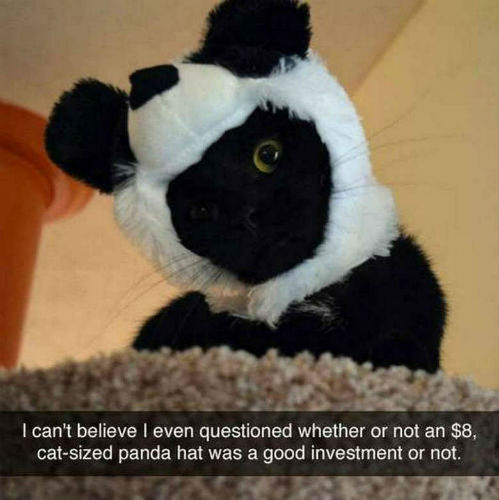 Is there a newsworthy story about an animal you would like to submit? Well, if the answer is "YES" you can reach us here at petmorons at gmail dot com. Nigerian princes and financial advisers need not apply. And "Have a great week!!!"